Simple, elegant, austere and perfect. These few words and their grander meanings sum up in entirety the wedding day of Janice and Owen, a young couple whose wedding we filmed this past month on May 10, 2014, with ceremony at St. Gabriel Catholic Parish and a Victorian reception at Casa Imperial. Janice, a native of Toronto, had met Owen, a student of Mathematics, whilst studying English Literature in the UK. The two, clearly drawn to each other through their intellectual pursuits, found themselves as complements of one another, and discovering together an unbounded emotion whose depth is greater than the uncountably infinite, and whose breadth is wider than any Shakespearean exposition could ever encapsulate. 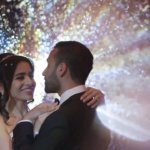 We here at SDE Weddings, Toronto’s premier wedding videography and cinematography group, are ever enamoured by the profundity of how something as simple as the ‘union of two’ rooted in marriage can transcend the transcendental, rationalize the irrational, and fill in the disparate gaps of a continuum incomplete. Such was our sentiment of Janice and Owen’s minimalist approach to their wedding day itinerary, of which serves but one half of two ceremonies, the other being held in England wherein our work for them would be played back for Owen’s family and friends. In that sense, it’s no stretch of a metaphor to say that for the young couple and their wedding wishes, that ‘all the world’s a stage’ for the ceremony whose significance completes Janice and Owen’s lives as one. The day of filming for our videographers began at mid-morning with one of our crews arriving at Janice’s to film the bride and bridesmaids’ makeup and prep session, and another crew arriving at Owen’s condominium. 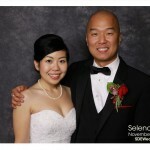 The couple chose a very simple yet stately schema as far as wedding wardrobe was concerned. Both bridesmaids and groomsmen agreed to a light turquoise for the colour theme of choice. The first photoshoot session of many began during this time. Here, a bespectacled Owen sat shuffling through permutations of a 3×3 Rubiks’ Cube, ‘speed-cubing’ being one of the more eccentric hobbies of his, perhaps solving a minor morning puzzle to reach a moment of zen before facing the future ahead of him. Several of Owens’ closest friends and family arrived as well from the UK to attend the ceremonies, so Owen was certainly not without a familiar face among Janice’s loved ones here in Toronto. The couple were wed at St. Gabriel Catholic Parish, to the orisons by which this day will be remembered. With the wedding set in stone, Janice and Owen had crossed one of life’s many boundaries, the past closed from them, and an open future ahead. From the crowd, the applause of many in attendance, especially from Janice’s grandfather in seeing her all grown up and walking down the aisle. After the ceremonies were complete, the wedding party along with our videographers proceeded north to Markham’s Toogood Pond Park, a densely wooded ravine on the outskirts of GTA proper, a prime location befitting ‘A Midsummer Night’s Dream’, if even a few months early. 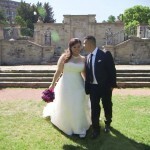 For the reception afterwards, the couple chose Casa Imperial on Steeles, whose setting is a historic Victorian mansion amidst one of Toronto’s many Chinatown districts. Once everyone was settled in, the newlyweds began the traditional Chinese wedding tea ceremony, with Janice and Owen in traditional garb, a peach pink Cheongsam and a deep blue Changshan respectively. You can see a few scenes of the ceremony in the highlight video. The night would proceed with ten full courses to fill all attendants’ appetites, a string of sentimental speeches from Janice and Owens’ closest loved ones, and the newlyweds traversing table to table to toast each and every wedding guest. A special speech from Janice and Owen themselves would signal the denouement of the night, and as our videographers winded down their reels, a cheer to the couple at the end of the night would state that all was well, and ended well. We at SDE Weddings, Toronto’s premier wedding videography and cinematography group, were proud to put our all in filming and commemorating Janice and Owen’s special day, and hope that our work for them serves as a proof of the limitless and unbounded power of love, of which their wedding were a credible corollary to. QED.